It is too soon to apply a purely objective approach to forecasting the outcome of the Republican primaries. But I do not think that it is too soon to start getting specific about the chances that we might assign to each candidate. Most of the crucial candidates have kicked off their campaigns. Debates are being held, the Iowa Straw Poll is only about 50 days away, and one candidate has already begun running commercials in Iowa. What will follow, in a three-part series, is the way I would handicap the Republican field as of today. In this piece, we’ll look at the four top candidates, in my view. The odds listed below are based on a combination of objective and subjective factors. I’m constantly thinking about the Republican field in this fashion, comparing the odds I’d assign to each candidate with those that are available, for instance, according to betting markets like Intrade. Although I’m reluctant to publish specific numbers without the backing of a formal statistical model, I thought I should be explicit about sharing my thought process with you. This is also a good excuse to touch at least briefly upon each candidate, including some whom I might not have written about for some time. The Republican contenders currently sort themselves into five relatively neat groups or tiers, although one group consists of a single candidate. That candidate, Mitt Romney, the former governor of Massachusetts, has broken away from the pack and is the front-runner. Mr. Romney is perceived as having run a slow-and-steady campaign — but he’s made the largest gains of any Republican candidate in the last two months, to an average of 26 percent of the vote in polls conducted in June from 18 percent in those conducted in April. Some of this is a result of other Republican candidates dropping from the field. 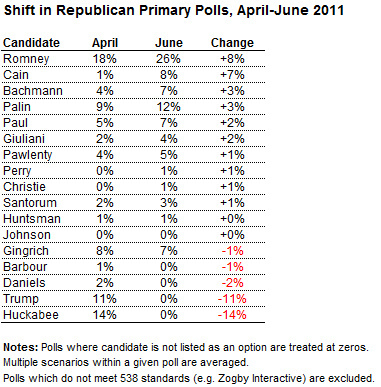 Yet while candidates like Tim Pawlenty and Newt Gingrich have remained flat in polling, Mr. Romney has gained ground. In fact, when I run Mr. Romney’s numbers through our purely objective model — which needs to be taken with ample grains of salt but can, perhaps, provide a useful starting point — it gives him pretty close to a 50-50 chance of being the Republican nominee. Historically, once a candidate’s polling gets into the high 20s or the low 30s, he can be thought of as a legitimate front-runner, rather than first among equals. I list Mr. Romney as having only about a 40 percent chance of winning, however, because of the concerns over how his health care bill might play out once voters become more exposed to it, and his apparent reluctance to fully engage in Iowa. But Mr. Romney also has some factors working in his favor. He’s a former governor, and governors historically outperform their polling. He has run a campaign for president before, something few other Republican candidates have done. He has something of a firewall in New Hampshire, where his polling is very strong. He does well when it comes to raising money. And Mr. Romney can point toward polls showing him running reasonably well against President Obama — some polls show him roughly tied against Mr. Obama, for instance, something that is not really true for any of the other candidates. Although I don’t think these head-to-head polls have much predictive value at this early stage, that doesn’t mean they can’t make for good talking points. Mr. Romney (perhaps along with Jon Huntsman) already seems to be speaking as much to a general-election audience as to Republican voters. That strategy implicitly emphasizes the candidate’s “inevitability” and encourages voters to look forward to November. It can backfire: recall what happened to Hillary Rodham Clinton four years ago. But my guess is that the weaker Mr. Obama’s position seems to be (and it’s weaker now after a month of poor economic numbers), the more those arguments will resonate with Republican voters. Following Mr. Romney are three candidates who, while not quite sharing his position of strength, have the most control over their electoral destinies. I’ve generally considered myself to be somewhat bearish on Mr. Pawlenty’s candidacy, mostly out of concern that he lacked the raw political talent to differentiate himself from the pack. In some ways, these concerns might seem to have been validated by the last couple of months. Mr. Pawlenty’s polling has barely improved, despite increasing name recognition. He missed an opportunity to attack Mr. Romney during the Republican debate in New Hampshire last week. And he has a potential problem in the form of Rick Perry, who could adopt a somewhat similar strategy and compete for some of the same voters and resources. Still, at the price being offered at Intrade, which gives Mr. Pawlenty just a 10 percent chance of becoming the nominee, I think he is an attractive buy. Along with Mr. Romney, he’s been running a full-fledged campaign from the get-go — really, since the day the 2008 campaign ended — which could pay all sorts of “intangible” dividends down the road, from having a staff capable of weathering speed bumps to doing well in states like Iowa that require a candidate to have a lot of roots in the ground. His ideological positioning is very close to that of the median Republican voter, and polls find that a very high percentage of the Republican electorate considers him an acceptable (if not necessarily exciting) nominee. He’s a former governor and one who has run in a couple of competitive campaigns. And he clearly has a decent chance to win Iowa, particularly if Mr. Romney fails to commit fully. If Mr. Perry were to announce this afternoon that he was running, I’d list him and Mr. Pawlenty at roughly equal odds to win the nomination. Both have traditional credentials and can appeal to a fairly large segment of the Republican electorate. Both have some geographic advantages — Mr. Pawlenty’s potential strength in Iowa, and Mr. Perry’s in the South. That isn’t to say that the two candidates are identical. Mr. Perry is a little more dynamic on the stump and might prove to be the better fund-raiser, whereas Mr. Pawlenty (even if Mr. Perry enters the race) will benefit from having begun his campaign earlier and may be perceived as being more electable. I’d view these factors as essentially canceling one another out. But Mr. Perry is not yet fully committed to running — an adviser told Politico that the chances were closer to 50-50. I suspect the odds are a touch better than that — Mr. Perry’s interest in the campaign is clearly more than casual, and it’s not a bad sign that a candidate is doing his due diligence. Still, it’s too soon to take for granted that he must be written into the script. Also, if and when Mr. Perry decides to run, he will be subject to more scrutiny than he is receiving currently. It is not obvious, for example, that Republican thought leaders will hold him in the same high regard that they do Mr. Pawlenty. Ms. Bachmann has averaged 7 percent of the vote in polls conducted so far in June — a slight improvement from a couple of months ago, but not a terrific performance. That does not distinguish, however, between polls conducted before and after last week’s Republican debate, where she performed very well and announced her candidacy. The only post-debate poll that meets our methodological standards had Ms. Bachmann surging to 19 percent of the vote (although the poll did not include Sarah Palin). Her standing has also improved significantly in some state-level polls. My view is that if Ms. Bachmann’s polling settles into the mid-teens, she will have elevated herself from being a wild card to being a legitimate contender for the Republican nomination. In fact, there is probably some upside in the numbers: her name recognition is not yet universal (62 percent of Republicans could identify her in the most recent round of Gallup polls), and as it grows, she may gain support from low-information voters who had previously expressed a preference for well-known politicians like Sarah Palin or Newt Gingrich. Of course, her candidacy has its issues. One is that she is a member of the House of Representatives, and members of the House don’t have a very good track record in primary campaigns. I don’t think this is a major drawback. My analysis suggests that while governors perform better than members of Congress there is little difference between how senators and members of the House perform, relative to their polling. And Ms. Bachmann has essentially been a nationalized figure for several years; she is the leader of the Tea Party Caucus, and her re-election campaigns have drawn tens of millions of dollars in contributions, tantamount to what a Senate or gubernatorial candidate would normally receive. The more significant barrier is that Republicans might be worried about her chances in a general election. Ms. Bachmann’s voting record, according to the objective system DW-Nominate, is roughly as far from the middle of the electorate as George McGovern’s was in 1972 — and her red-meat rhetoric does nothing to disguise those positions. If Ms. Bachmann won Iowa, there would be an effort to rally around some more moderate alternative, most likely the candidate who wins New Hampshire. Ms. Bachmann could get lucky if the establishment vote is stalemated between two or more alternatives — for example, Mr. Romney and Mr. Pawlenty — while she monopolizes votes from the conservative wing. But most likely, she will need to be at the top of her game to survive this. Ms. Bachmann has a lot of natural talent, as was on display during the debate. Unlike Ms. Palin, she seems to recognize that it takes a village to run a presidential campaign, having surrounded herself with competent advisers like Ed Rollins, who managed Mike Huckabee’s overachieving campaign in 2008. Even those who are skeptical about her candidacy would probably concede that she has a good chance of winning Iowa, where she was born and will devote much of her attention. It’s hard to say exactly how much value Republicans will place on electability. But “extreme” candidates like Mr. McGovern and Barry Goldwater have received their party’s nominations before, and the conditions for a repeat of these circumstances are probably better than average. My view is that there is about a 1-in-5 chance that Mr. Obama will benefit from running against such a candidate, with Ms. Bachmann being the most likely of those alternatives. We’ll look at the next tier of Republican candidates in the next part of the series.